The IPL fervour has gripped the nation ever since its inception, owing largely to the intense on-field action and unparalleled crowd support. Brendon McCullum’s blitzkriegs in the very first match of the inaugural edition of the world’s greatest T20 league set the world on fire. There has been no looking back ever since, thanks to the IPL’s credentials as a breeding ground for upcoming talent. A star-studded batting line up made CSK firm favourites for lifting the trophy in the maiden season. In their very first encounter against the KXIP, CSK showed glimpses of team brilliance that became a norm for the MSD lead side in the years to come. CSK won the toss and decided to bat first at Chandigarh. 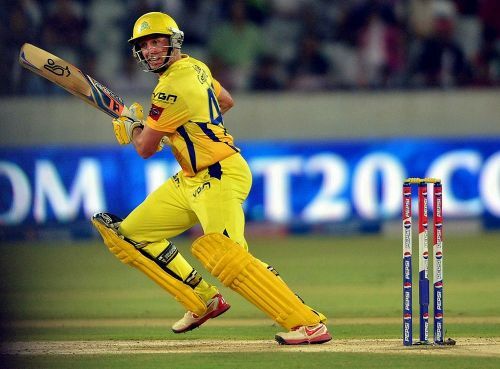 Michael Hussey wielded his bat like a toothpick, collecting himself 116 runs in the process off just 54 balls. Subramaniam Badrinath's cameo of 31* pushed CSK to a mammoth 240 in their 20 overs. KXIP's laudable efforts were mostly concentrated around Kumar Sangakkara's 54 and James Hopes' 71. Hopes, in particular, took a leaf out of Hussey's book as he batted at an astonishing strike rate of 215 throughout his innings. KXIP eventually fell short by 33 runs. Hussey was awarded the man of the match for his commendable performance.